In August 1996, a lanky 35-year-old, with some money made in stock trading, and wealth inherited from planter parents, opened a coffee outlet on one of Bangalore's high streets. His promise was audacious: he would sell espressos and lattes in filter coffee country. To that extent he was unsure of the future. Fifteen years later, in the same month of August, the last feeling V.G. Siddhartha has is that of doubt. With some 1,174 Cafe Coffee Day, or CCD, outlets in the country, his coffee empire is frothing. From Katra in Jammu & Kashmir to Krishnagiri in Tamil Nadu, from Shillong in Meghalaya to Sangli in Maharashtra, and most towns that count in between, his retail chain touches a million users every day in one avatar or the other: CCD delis, Xpress kiosks, Fresh & Ground coffee powder vends. The next stop on the radar before Siddhartha, a six-foot-tall billionaire who eschews attention, is your kitchen counter. At a recent meeting in his office on Bangalore's Vittal Mallya Road, CCD's Founder-Chairman showed off a single-serve coffee machine that can dispense a cup of coffee - espresso and, if you add milk, cappuccino or latte - in 20 seconds flat. Branded Coffee Day Wakeup, the five kg, 30 cm tall machine, is scheduled for launch later this year. Siddhartha will not say as much but the machine is a knock-off of Nestle's Nespresso and its several clones that have taken the West by storm with their easy-to-use coffee pod-and-machine combination. He thinks the product, based on an Italian patent and worked upon further by an in-house 10-person research and development team, will succeed because it is going to be "attractively priced'' - under Rs 5,000 apiece, and the coffee capsule, with seven grams of coffee powder, at Rs 10, according to the industry buzz. Comparable products by companies such as Italy's Lavazza retail for around Rs 15,000. Taking on global brands is the next phase in Siddhartha's business trajectory. "My dream is to see ourselves among the top three retail coffee brands in the world. It may take 10 years for us to build ourselves as decent global players in the coffee industry," he says. By number of coffee outlets, his retail chain today figures among the top six globally, behind Starbucks, Dunkin' Donuts, Tim Hortons, Costa Coffee and McCafe, some of which are part of bigger chains. "Our own target is to have 2,000 stores in India and 200 overseas, mostly in Eastern Europe, by December 2014," he says. In India, Delhi and Mumbai will remain the hotspots of growth, he adds. Private equity firms such as New Silk Route Advisors, Standard Chartered PE, and Kohlberg Kravis Roberts want to be a part of the journey. They invested Rs 1,027 crore in the holding company of the Coffee Day Group last year. Siddhartha "is several times the size of his closest competitor; he recognises the elements needed to upscale and has improved on them," Jacob Kurian, the Bangalore-based Partner at New Silk Route Advisors, told Business Today in an interview last year for the cover story India's Coffee King in the issue dated May 16. Step into any CCD outlet - the chain started two premium, mark-up cafes sub-branded The Lounge and The Square last May - and what is drawing big ticket backers to Siddhartha becomes evident. The coffee is served efficiently, the outlet is clean and the setting relaxed, yet peppy. The typical customer is as old as or younger than the median Indian's 26 years, and is mostly never alone. Half of India having being born after 1983, CCD is today one of the widely discussed brands on the Net and the company likes to call itself 'India's largest youth aggregator'. From a global perspective, the Indian cafÃ© market is small, but within India, cafes are big business, according to retail consultant Harish Bijoor. "Cafes today are emerging to be points of active retail. A cafÃ© is becoming the crucible of an emerging young India; it is the new adda of youth," he says. 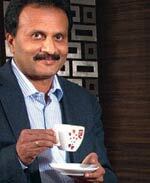 CCD opens one outlet every working day, says Chief Operating Officer Amara Venu Madhav. Such an expansion rate will make the chain 1,200-strong before Diwali in the last week of October this year. The chain matches this drive with ruthlessness when it comes to performance falling short of expectations: on an average, it closes an outlet every two weeks. The retail industry regards Siddhartha as one who has altered the coffee calculus in India by unleashing a wave of cafe culture. His success brought in global brands to India such as Lavazza - which has a majority stake in Barista; Costa Coffee, Coffee Bean & Tea Leaf and Au Bon Pain, among others, with Starbucks and Dunkin' Donuts expected soon. And, as cafes have grown in number, domestic consumption of coffee has shot up, nearly doubling from 55,000 tonnes in 1990 to 102,000 tonnes in 2009, the latest year for which India's Coffee Board has data. Of the total consumption, Siddhartha's companies and family - the latter owns and runs some 10,000 acres of Arabica plantations - trade in some one-third by volumes. "Right now, we are consuming far more than what we are growing at our plantations. We buy beans from 10,000 growers and last year, handled 35,000 tonnes of beans. We consumed 6,500 tonnes ourselves and exported the rest," says Siddhartha. Still, trading makes for low margin business with cash profits of three to four per cent compared to the healthier retailing operations. CCD and other retailing businesses are housed under Amalgamated Bean Coffee Trading Company. 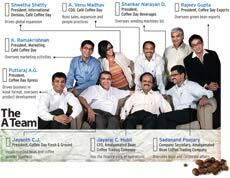 Revenues from coffee retailing touched Rs 1,025 crore in 2010/11 and expect to top Rs 1,200 crore in 2011/12. The chain makes about 10 to 12 per cent of cash profit, which Siddhartha defines as net profit plus depreciation. "If I am able to grow my business at 25 to 28 per cent and earn 10 per cent of it as cash profits, I am happy," says Siddhartha, adding he expects compound annual growth of at least 20 per cent in the next five years. In other words, Rs 3,000 crore by March 2016. That may not sound very much - Pantaloons, which runs brands such as Big Bazaar, Food Bazaar and KB's Fairprice, recorded revenues of nearly Rs 6,000 crore in 2010/11 - but the potential of a retail chain with 2,000 company-owned outlets is immense. Even today, CCD leads among retail chains when ranked by number of outlets. It runs more stores than the likes of Apollo Pharmacy, The Mobile Store or Raymonds. Retail experts say only the Indian Army's Canteen Stores Department, or CSD, has more stores numbering about 3,000. Think of CCD selling products with what marketers call "strong adjacencies". If coffee and merchandise can be sold, why not high-speed Internet connections, movie downloads and financial products as well, goes the logic. In theory, the potential is immense if the choice of products or services sold is made wisely. "It will work if there is a synergy between the CCD brand and the new product introduced. It is, however, wise not to stretch the brand meaning by expanding into too many product categories,'' says IIM-B's Moorthi. Bijoor, the retail consultant, paints the opportunity before the quiet CCD chief executive. In a study that his firm carried out this July in 26 small towns in India, Bijoor ranked Cafe Coffee Day among the top five brands youngsters could recall. The other four: McDonalds, Reebok, Nike and Levi's. "Cafe Coffee Day has an opportunity to brandcolonise smaller towns where the aspiration lies," he says. Siddhartha's story may be just beginning. Nuclear Power Corporation - Atom Corp.